In this post I'm presenting you one of Parfois bags. 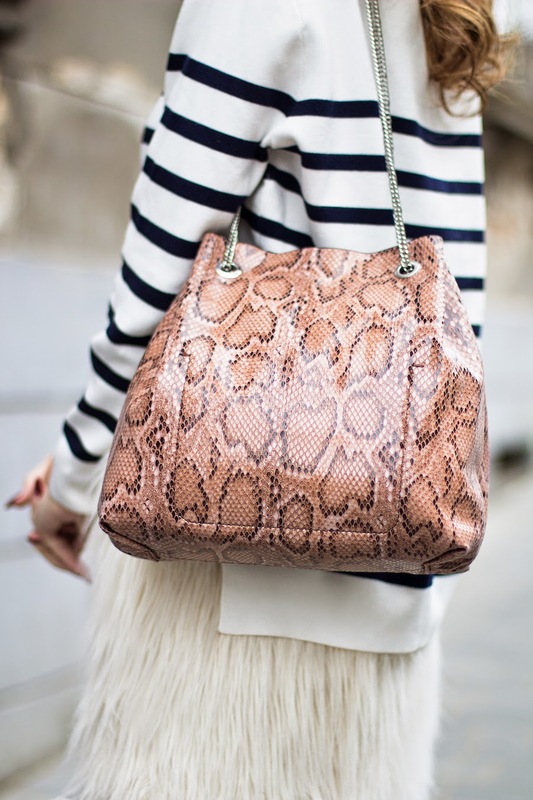 I love this python bag that I matched with a classic outfit. I'm wearing an oversized sailor straps shirt and a fluffy skirt. As you may have read on my instagram (@isabellaeclaires) tomorrow you can join a giveaway that will be on my blog. We will be giving away 4 Parfois bags, the special model from Madera collection. The gigantic size of this specific bag is now in front of Zagreb's most famous shopping centaur Arena, where you can also find the Parfois shop (find out more here). The bag comes in 4 different colours. Don't forget to join my giveaway, remember, we'll have 4 winners! Your purse is perfection! Cute look. very nice bag and skirt! a suknjica je čisto savršenstvo.